In a special Doctor’s day function organized on 1st July at Maulana Azad Medical College, Delhi Medical Association honored Padma Shri and Dr B C Roy National Awardee Dr K K Aggarwal President Heart Care Foundation of India with “Vishisht Chikitsa Ratan Award”. The award was given by Hon’ble Lt Governor of Delhi Mr. Tejinder Khanna. 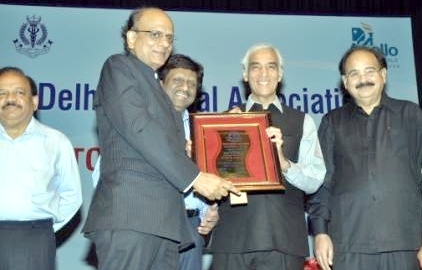 Dr Aggarwal received this award for outstanding contribution to the medical profession and the society. Dr Aggarwal is known for his contribution to the society as an anchor, writer, columnist, public speaker and a campaigner. He is also known for his annual event Perfect Health Mela. Speaking on the function Mr. Tejinder Khanna said that British prefer Indian doctors at the National Health Service over their English counterparts as they have accomplished distinguished work in the health-care service. He said that Indian doctors are unique as they serve the patients with a touch of compassion and humanity. The Delhi Lt Governor also paid tribute to Dr Bidhan Chandra Roy who was the founder member of Medical Council of India. Doctor’s Day is celebrated every year in his honor on the date of his birth (and death) July 1. On the occasion Dr Harshvardhan Former Health Minister Delhi said that Medical Professionals do not need a certificate of merit from the film actors for their nobility. Dr A K Walia Health Minister of Delhi said that medical profession can and is doing a lot to the society. Forty four doctors were also honored at the DMA function. Notable among them include Dr P K Dave, Dr Ranjit Rai Chaudhary, Dr J S Pasricha, Dr Ashok Seth, Dr Rajgopal, Dr Ambrish Mithal, Dr Y P Munjal, Dr OP Kalra, Dr D S Rana, Dr G K Mani, Dr Shekhar Aggarwal, Dr Neelam Mohan, Dr Subhash Gupta, Dr G K Mani, Dr Ajay Gambhir, Dr Girish Tyagi, Dr P Lal, Dr Bawa Das, Dr Rajesh Chawla, Dr Nimesh Desai, Dr. Mahesh C. Misra, Dr. A.K. Aggarwal, Dr. S.K. Sarin, Dr. S.K. Mittal, Dr. Praveen Khilnani, Dr. Sunil Gomber, Dr. Sumit Ray, Dr. Adarsh Chaudhary, Dr. Radha Krishnan, Dr. Anil Aggarwal, Dr. Harsh Mahajan, Dr. Yatin Mehta,Dr. Ashok Khurana, Dr. Anurag Krishna, Dr. Atul Kumar, Dr. Daljeet Singh, Dr Ajay Kumar, Dr Kunal Bagchi, Dr. Rajendra Prashad Tripathi, Col Dr. Rajat Dutta, Brig. Dr. S.S. Anand, Dr. A.K. Dewan, Dr. P.K. Bhardwaj, Dr. P.S. Nayyar, Dr. G.R. Sethi, Dr. I.C. Verma, Dr. Jagdish Suri, Dr. Vinay Goel, Dr. Sundeep Guleria, Dr.Mohan Nair and Dr. Ravi Malik.